Introduction The Mi 5 went on sale in April and the market has changed quite a bit since then. While Xiaomi is having a very successful year so far, especially with the mid-range Redmi series, the competition in the higher-end is unprecedented. In the wake of the Galaxy Note7 demise, the iPhone 7 release, and the V20 stepping up LG's game, Xiaomi is shifting the spotlight back to the Mi flagships with its new Mi 5s and Mi 5s Plus updates. The Xiaomi Mi 5s takes after where the Mi 5 left off and makes a few notable steps to improve its flagship status - it switches to the latest Snapdragon 821 chip, ups the base storage, and the most obvious change - it retires the glass panels in favor of a metal unibody. The main camera is one of the highlights of the series, and while the Mi 5s wasn't treated with the dual-camera upgrade, it's sensor is as premium as it can get. Instead of the small 16MP 1/2.8" sensor, the Mi 5s offers a bigger 12MP 1/2.3" one. The sensor's pixels grew 40% bigger thanks to the bigger estate and smaller resolution, which will help the Mi 5s resolve more detail and capture more light in the long run. Finally, there is more battery juice available to the new MIUI 8 and, in combination with the power-efficient Snapdragon 821 chip, our expectations are quite high. So far, so good. The Mi5s, however, is not all about upgrading. While the design and some of the hardware bits are now better compared to the Mi 5, some of the good stuff was axed, too, such as the camera's Optical Image Stabilizatoon (OIS), the Gorilla Glass 4 on the screen, as well as the IR port. The force press support on the other hand is exclusive to the 128GB model only so few people would get to enjoy the feature. The rest of the omissions are hardly a surprise to any Mi fan. Xiaomi only puts microSD slots on its more affordable phones and they hardly have a phone with a user-removable batery so we didn't expect otherwise in both these respects. Enough talking, the Mi 5s is ready to pop out of the box and introduce itself. Follow us after the break with the unboxing and our traditional hardware checkup Unboxing the Xiaomi Mi 5s Xiaomi Mi 5s comes in a rather small box, which contains only the basics - a USB Type-C cable and a wall plug. Luckily, the provided charger supports QuickCharge 3.0, so you won't need to buy a new one. Xiaomi Mi 5s 360-degree spin Xiaomi Mi 5s spreads at 145.6 x 70.3 x 8.3 mm, which is just a millimeter taller, wider, and thicker in comparison with the original Mi 5. The Mi 5s has gained some weight, though, due to the design shift towards metal. The phone now weighs 145g, 16g heavier than the Mi 5. 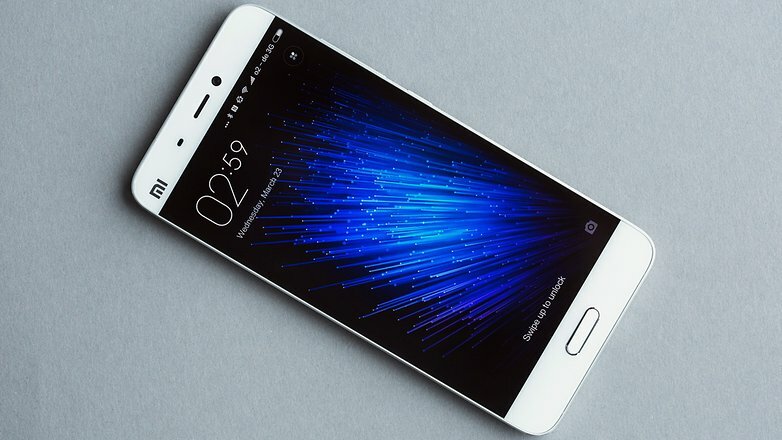 Design Xiaomi Mi 5s looks a lot like the Mi 5, or at least we thought that at first. It has curved sides all around its back, while the entire front is covered in glass. So far so good Then again, we remembered the glass and ceramic editions of the original Mi 5 and that's when we stopped staring at this beauty and realized Xiaomi switched from glass to metal. And that's a great thing. Some tests on YouTube has revealed how fragile the Mi 5 really was and we are glad Xiaomi worked to improve on that by opting for an aluminum unibody. And it didn't make it cheap with huge antenna strips on the back, instead it did just like Apple and HTC by letting tiny rubber lines flow around the metal covering all the phone's antennas The metal body and its pleasant matte finish improved the grip by a mile, while the extra weight is welcome as it makes the Xiaomi Mi 5s feel a lot more solid. The Mi 5s, thanks to its 5.15" screen, is still a very compact phone and a pleasure to handle. It fits easily in any pocket or purse and the newly improved grip will make shooting pictures and images easier (and surely, less prone to accidents!). Controls Xiaomi Mi 5s has a pretty standard set of controls. Above the screen is the earpiece flanked by a couple of sensors and the 4MP selfie camera. Below the display is the familiar trio of capacitive touch controls. The Home key is not clickable and has an embedded always-on fingerprint scanner within its surface. The Task Switcher and Back keys are marked by two tiny dots with white backlighting. Xiaomi uses the Qualcomm's ultra-sonic technology, also known as Snapdragon Sense ID, on its fingerprint sensor. The utlra-sonic sensor detects the ridges, pores, and other details on your finger by transmitting sound towards the finger, which bounces back on the receiving surface. In theory, this method should be more accurate and faster than the wide-spread capacitive sensors, which scan a 2D image. It is indeed very fast and responsive, but it is just as fast as the one used on the Huawei P9. And its accuracy isn't something to talk about either, because there are times when the sensor underperforms. The left side of the Mi 5s has the dual-SIM tray, while the right one houses the volume rocker and the power/lock key. The analog audio jack is lonely at the top, while the bottom of the Mi 5s packs the USB Type-C port surrounded by two symmetrical grilles - one for the primary mic and one for the loudspeaker. Finally, the new 12MP snapper is on the back accompanied by a two-tone LED flash. The second mic is also around, embedded within the antenna band. Display The Xiaomi Mi 5s features a 5.15" IPS display of 1080p resolution, similar to the one utilized by the original Mi 5. A density of 428ppi is more than respectable and leaves the Snapdragon 821 chip with power to spare on tasks and productivity, so we don't mind the lack of Quad HD resolution. Unfortunately, Xiaomi didn't mention any specific glass protection for the screen and we can confirm the Gorilla Glass 4 is gone for good. The Mi 5s acquired lots of big scratches on top of its display just in the week we had it for a review. We suggest that you apply a screen protector on it as soon as you take the phone out of its box. Other than that, the screen offers great viewing angles and there is hardly any color shift or contrast loss when looking the Mi 5s display at an angle. Xiaomi claims the screen will provide up to 600 nits of max brightness. Our test results confirmed and even exceeded the claim for maximum brightness as we measured 650nits worth of luminance. The minimum display brightness is 1.1nits, which is perfectly suitable for late-night reading in a dark room and it's even lower than the Galaxy S7's. The screen's contrast ratio is excellent as well at 1294:1, though slightly less than the promised contrast ratio of 1500:1. Note that we did our color test in Standard (constant) screen mode. If you opt for the Auto one, you will get punchier colors at the expense of color calibration.When it comes to color rendering, the Mi 5s has an excellent color rendering with an average DeltaE of 3.5 and a maximum deviation of 4.5 in the gray color. If all colors stay below 4, the screen is considered to be of perfect calibration level accuracy and the Mi 5s almost achieves that. Finally, the bright screen of the Xiaomi Mi 5s performed excellently in our sunlight legibility test, too. Posting a very high value for a non-AMOLED panel, the Mi 5s ranks the same as its predecessor. Battery life The Xiaomi Mi 5s is powered by a 3,200mAh battery, which seems more than enough for a 5.15" device. It's also 200mAh beefier than the one inside the original Mi 5. We ran our battery test, and the Xiaomi Mi 5s scored an 84h rating, which means you can count on the battery to last three and a half days if you do an hour each of calling, web browsing and video playback a day. While the browser and video playback times are similar to the ones we got from the Mi 5, the call test and the standby performance turned out a bit lesser and thus the reason for the lower final rating. If you want to use the phone with two SIM cards, you'll end up with an 80h rating. While the rating is quite good for a flagship, we are a bit disappointed. The Mi 5s should have brought us better battery life thanks to its bigger battery, energy-efficient chipset, and optimized MIUI 8, but apparently - this didn't happen. Connectivity The Xiaomi Mi 5s supports 9 LTE bands, and you can tap to an LTE network on either SIM, but once you do, the second one will be limited to GSM connectivity only. As for that, the Mi 5s also offers quad-band GSM connectivity. There is quad-band 3G connectivity with HSPA support. The rest of the connectivity features include single-band Wi-Fi a/b/g/n/ac support and Wi-Fi Direct. There is also support for Bluetooth 4.2, NFC, GPS with GLONASS and Beidou. There is no FM radio support. Xiaomi Mi 5s comes with USB Type-C port. Media transfer mode is supported for accessing the phone's built-in memory over a USB connection. The port also supports USB On-the-go for connecting USB peripherals such as pen drives, keyboards or USB hard drives, but you'll need to buy a proper adapter for that. Wireless screen mirroring is available via the Miracast protocol. There is no IR blaster on the Mi 5s. The MiRemote app is on board, but it can only control smart devices connected to the same wireless network. MIUI 8 on sweet Marshmallow The Xiaomi Mi 5s comes with Android Marshmallow and MIUI 8.0. MIUI is one of the most comprehensive customizations of Android to date. It has a big following in China where Google services are not accessible so Xiaomi refocused the ecosystem away from Mountain View's services. For those living elsewhere, the official and not-so-official importers are providing various international (global) ROMs, which come stripped from the Chinese services, in favor of Google's. MIUI 8 starts off with a fresh overhaul on the visuals but the new icons, color scheme, and animations are more of a refinement rather than a departure. But the looks are just a minor part of the way MIUI is different from stock Android. The highlights of the new features are Dual Apps and dual spaces. Dual Apps means you can have two instances of the same app on your device, so you can, for example, have two WhatsApp accounts on the same phone, one for each SIM, something you couldn't do before. Any app can become a dual-app - you just need to enable it from settings.The second instance has a yellow indication on its app icon, so you'll always know which instance you are opening. Dual spaces lets you have two different workspaces on your device, each with its own set of apps, customizations, and image gallery, and you can enter a custom passcode or a different fingerprint to enter either of the space. Configuring a second space is very easy and straightforward. After setting a different PIN and/or fingerprint, you can import and share photos, files, and apps between the two spaces, or choose to keep those entirely separated. You can also opt to view notifications from the other space, so you won't miss anything. Switching between those spaces is hassle-free (you even get a Switch shortcut in the notification drawer), and it's lightning-fast thanks to the Snapdragon 821 chip and the 3 (or 4) gigs of RAM. There are more novelties in MIUI 8. The Phone app and Caller ID are smarter than before now. There is also a brand new Gallery app, a new Notes app, new advanced image and video editors, and a new Quick Ball function that puts a hovering circle on the side of the display that houses quick shortcuts to various functions. Touching Quick Ball pops up to 5 shortcuts and you can put here pretty much anything - from Android actions to app shortcuts. The Ball can also hide automatically on chosen apps, and move aside when you are running a fullscreen app. The lockscreen is fairly standard (time, notifications, a couple of shortcuts), but once you set up the fingerprint reader, you'll rarely see it anyway. Still, the Wallpaper Carousel can put beautiful images on the lockscreen every 15 minutes. The always-on fingerprint sensor proved quite accurate and can take the phone from sleep to homescreen pretty quickly (the lockscreen is bypassed). It's as fast as some of the latest flagship implementations, which is quite a treat. MIUI has a simple philosophy - every shortcut, plus widgets of your choosing, are dropped on the homescreen. You get a docked menu for the most commonly used apps, of course. The homescreen also supports wallpaper carousel, you can enjoy different beautiful wallpapers all the time. The notification drawer sees the biggest visual change, with a consolidated list of quick toggles, notifications, and a weather panel at the top that changes color and animation according to the weather. The app switcher feels like it came out of iOS - apps are either represented by their icons, in a single horizontal row, or by appropriate thumbnails in the same manner. Themes are fully supported and several are available out of the box. You can download more - they change wallpapers, lockscreen style, system icons and font, sounds too. Finally, MIUI 8 supports scrolling screenshots - the feature lets you take a screenshot of an entire page by scrolling and combining multiple images into one long screenshot that you can then crop to your liking. Performance The Xiaomi Mi 5s runs on the latest Snapdragon 821 chipset with 3GB of RAM. There is a more powerful Mi 5s model with 4GB RAM and double the storage, too. The Snapdragon 821 SoC improves on its predecessor with better power efficiency and higher performance. You can't have both at the same time though - the manufacturers can either opt for the slightly higher processor and GPU frequency for about 10% performance bump (as is the case with the Mi 5s Plus phablet), or keep the original clocks in order to gain better battery life. Xiaomi chose the latter for the Mi 5s and thus it offers the same quad-core Kryo processor with two cores ticking at 2.15GHz and two running at 1.6GHz as its 64GB Mi 5 sibling. The Adreno 530 GPU is also clocked at the same 624MHz frequency as the one inside the Snapdragon 820. There is no doubt the Snapdragon 820, and now 821, are among the most popular choices for the flagship crop, so even without running benchmarks, you can rest assured the Mi 5s is a beast. But we're not the kind of reviewers that work with assumptions, so we sure did run our fair share of benchmarks. Join us as we dig into those scores and framerates. A single Kryo core shows a rather uninspiring result within the GeekBench 4 benchmark, but it's on par with the competition, except for the A10 processor in the iPhone 7. It also doubles the performance of the Cortex-A53 inside the Huawei nova. You can also notice the 10% promised gap between the 2.1GHz Kryo inside the Xiaomi Mi 5s and the 2.4GHz Kryo CPU inside the Xiaomi Mi 5s Plus The four Kryo cores combined do great, as usual, but they can't compete with the combined power of the eight cores inside the Honor 8 (4xA53 + 4xA72), or the dual-core A10 Fusion CPU inside the iPhone 7. The 10% bump on the Xiaomi Mi 5s Plus is once again clearly visible in the multi-core results, which means Qualcomm fully delivered on its 10% performance jump. Moving on to Basemark OS II 2.0 to look at some numbers representing overall performance. Here the Mi 5s is in a group with its Mi 5 brother and the OnePlus 3, running on the same chips. It did a notch better compared to all other devices we've tested but the iPhone 7, which might be due to a faster storage or more efficient MIUI 8. Antutu is also showing the Mi 5s in a good light - it outs the same scores as all S820 devices we've tested so far, though the OnePlus 3 has some supremacy here. The BaseMark ES 3.1 test is also available on the iPhones, where the iPhone 7 is ruling the chart by miles. The Mi 5s does about the same as the other Adreno 530-powered smartphones, but behind the Galaxy S7's Mali-T880MP12 GPU. The GFX tests reveal that the Mi 5s raw performance is on par with the other Snapdragon 820/821 devices, and can be bested only by Apple's A10 GPU. The Mi 5s has an advantage over some of its competitors such as the Galaxy S7 and the LG G5, because of its lower screen resolution. The Adreno 530 is a monster when displaying 1080p resolution, though still not monster enough to beat the iPhone 7 Plus (also 1080p). Xiaomi Mi 5s delivers flagship-grade performance, there is no denying that. The phone runs cool at all times. The thing is Xiaomi may have overstressed the importance of having the Snapdragon 821 chip, as the chipset used for the Mi 5s has literally the same performance as its 820 predecessor. Camera The Xiaomi Mi 5s, just like the Google's Pixel flagships, comes with the new 12MP Sony IMX378 sensor. It is not very high resolution - 12.2MP - but it has 1.55µm pixels. Physically, it is a large sensor, too, 1/2.3", matching the Xperia Z series, which pumps out a lot more megapixels than the Mi 5s. The new IMX378 sensor is an upgrade over the IMX377 used on the Nexus 5X, 6P and HTC 10. It now supports phase-detection autofocus, faster and better HDR processing, higher frame rate support for videos. The highlight of the new optimizations is the handling a big chunk of the image processing on-chip thus reducing the workload on the image signal processor (ISP). The latter helps for shooting and processing HDR photos much faster. The 12MP sensor has a relatively wide aperture of f/2.0 and a two-tone dual-LED flash. The optical image stabilization from the Mi 5 is gone, though. The MIUI 8 camera interface is fairly simple and features toggles for the HDR mode, the flash and the video camera. The available advanced modes are Panorama, Beautify, Scenes, Timer, and Manual (with shutter speed up to 32s) as well as the camera settings. Seventeen live filters are at your disposal, too. When it comes to daylight shots, the Xiaomi Mi 5s gets a straight A right away. Its camera may not have as many pixels as its Mi 5 predecessor, but the per-pixel quality is very high. Noise is kept low and photos come out rich in detail without being over-sharpened. Even foliage is rendered great. The captured colors are very accurate, the white balance is right almost every time, and the dynamic range is way above average and definitely flagship-worthy. Finally, the bokeh effect in the close-up shots is quite nice, too. You'll probably want to leave the HDR mode on Auto, because the new sensor doesn't slow when shooting HDR. The HDR mode has got a massive improvement over the Sony IMX377 sensor, as promised. There is a huge improvement in the restoration of both the highlights and the shadows. Even the digital noise gets lower. Unfortunately, the low-light photos came rather unimpressive. The Mi 5s had really hard time getting the focus right and when it did, the images came out with poor detail and washed out. Luckily, you can use the manual mode and tweak the ISO and exposure time settings to achieve better low light sots, but you'll need a small tripod or at least a stable surface for shooting this way. The results are worth the hassle, though. The dusk shots, on the other hand, turned out OK with average detail and high dynamic range. You can capture both landscape and portrait panoramic photos with a 180-degree field of view. Shooting is easy and the resolution is very high (up to 60MP, 3,800MP tall). The image quality is above average - there is enough detail, no bad stitching and accurate colors. The dynamic range and the resolved detail could have been better, though. Xiaomi Mi 5s features the same 4MP UltraPixel front-facing camera for high-res selfies we met on the Mi 5. The images came out with more than enough detail, high contrast, and pleasant colors. The dynamic range is above average, too. We really like this sensor for selfies. The Xiaomi Mi 5s is more than capable of pulling its own weight in our Photo Comparison tool. You can see it puts up an excellent fight against the other snappers we've tested and comes on top even against some far pricier options. Video camera Video mode gives you a choice of 2160p @ 30fps and 1080p @ 30fps for common shooting with a 720p @ 120fps option if you want some slow-motion effects. There's no 1080p @ 60fps mode though, which would make a big difference for fast-paced scenes. Also, changing resolution involves going to Modes and then in the advanced settings, which isn't all that convenient. Anyway, the 2160p videos are captured at 42Mbps bitrate and have rock solid 30fps. The audio is stereo captured at 96KBps bitrate. The video quality is very high, among the best we've seen, with sharp (but not over-sharpened), detailed image. The colors are spot-on, while the dynamic range is above average. The audio quality is OK, there are no traces of compression, but you'll notice it goes towards poor on more demanding scenes (concerts, loud crowds, cars honking, etc.). 1080p videos are shot at 20Mbps bitrate and the same audio. The video quality turned out great for 1080p, also among the best we've seen so far, with great amount of resolved detail, accurate colors, and above average dynamic range. Unlike the 4K samples, the 1080p ones came out a bit over-sharpened, which may not be everybody's cup of tea. You can also download the 4K@30fps (10s, 50MB) and the 1080p video (10s, 25MB) samples taken straight off the Xiaomi Mi 5s. The new IMX378 sensor is capable of EIS and it's your only option for the videos since there is no optical stabilization. It works on both 1080p and 2160p videos and doesn't reduce the field of view. The results are a mixed-bag though. The stabilization indeed does a good job most of the time, but there is noticeable stuttering when panning or moving, which eventually ruins the positive first impressions. It's worth noting the poor stabilization results are not the sensor's fault. We've already tested the Pixel XL, which comes with the same IMX378 sensor and relies on EIS only, and the results were spectacular. Finally, you can use our Video Compare Tool to see how the Mi 5s stacks against the competition when it comes to video capturing in both 2160p and 1080p modes. Conclusion Xiaomi Mi 5s is a great flagship with excellent build quality, performance, battery life, and imaging skills. It makes a few notable upgrades over the Mi 5 predecessor - a metal unibody, a bigger battery, a more power-efficient chipset, and a capable main camera. But it also loses a few things over the Mi 5 that many would consider crucial - camera OIS and Gorilla Glass protection. The IR port is gone for good, too. So, is the metal body and the new camera sensor worth sacrificing the screen protection and the benefits of OIS for low-light photography? There is no easy answer to this. The Mi 5s is indeed superb at design, handling, power, and daylight shots. Its new software image stabilization helps the videos, too, but it's not as good as an OIS solution. But then again, people shoot a lot more in daylight rather than low light and the Mi 5s camera is a huge improvement over the Mi 5 regarding image quality. Long story short - Xiaomi Mi 5s is a true flagship with top-notch capabilities. And if it weren't for the easily scratchable screen, we'd consider it perfect. It's a worthy purchase due to its great pricing, though the Mi 5 owners should probably skip it and wait for the Mi 6 next year as they won't gain much from the 5s iteration. Xiaomi Mi 5s key test findings Build quality is excellent, and we like the metal unibody more than the glass one. The Mi 5s has stunning looks achieved by shape, choice of materials, slim profile, and lightweight body. The display is great: it offers 650+ nits of brightness, high contrast, and great legibility in direct sunlight. The minimum brightness is superb for night reading, the blacks are deep enough, and the viewing angles are decent. We wish it had a better protection against scratches. Battery life is very good with an endurance rating of 85h, but a step down from the Mi 5 where it should have been an improvement. Rich wireless connectivity options, but no FM radio or IR blaster. MIUI 8 is a clean and light shell on top of Android Marshmallow and offers rich customization options. The new Dual Spaces and Dual apps options are great additions. The Snapdragon 821 chipset offers stellar performance though there is no improvement from the Mi 5 and its S820 chip. If there is anything to note, it runs cool, and there is no apparent overheating or throttling. Audio output starts off great, degrades with headphones. The speaker loudness is very good, but the sound quality is barely average. Camera photos are great, with plenty resolved detail, high dynamic range, and excellent colors and contrast. The new camera produces better shots than the Mi 5 16MP snapper, but lacks optical image stabilization and sometimes that hurts the quality. The picture on the 4K and Full HD videos is excellent with plenty of detail and high contrast, but the 1080p samples came a bit oversharpened. EIS may cause some stuttering in videos and the stereo audio capturing is of poor quality. There are lots of options to consider if you are looking for a smartphone like the Mi 5s, but you haven't settled on a particular brand. The compact flagship class, where the Mi 5s falls under, has been flourishing this year. The LG G5 price, for example, has fallen to the Mi 5s levels, and the G5 will give you a better and higher-res display, a unique modular design, and an additional main camera for wide-angle shots. LeEco's Le Pro 3 is a good match for the Mi 5s with the same screen resolution, chipset, and a capable camera setup. It's cheaper and offers a bigger screen estate and battery over the Mi 5s, but its availability is quite limited. You may want to consider the ZUK Z2 Pro, whose price has fallen quite a bit since its release in June. It will give you an AMOLED screen and 6GB of RAM, powered by a Snapdragon 820 chipset and a 3,000mAh battery. The ZUK isn't among the most popular brands out there, but its unique glass design and launcher may fit you well. Samsung Galaxy S6 and S6 edge cost the same as the 64GB and 128GB Mi 5s respectively. Both offer higher-res AMOLED screens, very capable chipsets, and great 16MP main camera with OIS. The S6 edge has a superior design and you may want to give those two a try. There are two very intriguing 5.2" devices cheaper than the Mi 5s, yet equally intriguing - LG Nexus 5X and Samsung Galaxy A5 (2016). Both are powered by lesser chips, but offer great designs and user experiences. The Nexus, as usual, focuses on pure Android OS and fast updates, while the Galaxy A5 has a punchy Super AMOLED screen and OIS main camera. Finally, there is always the old Mi 5, which has a glass back, a higher-res camera with OIS, and a better battery endurance. And you get these for less cash. Instead on a high note, we'll end this review expressing our mixed feelings. The Xiaomi Mi 5s is easily likable and ticks all the right checkboxes for a flagship phone. The thing is that we already had that with the Mi 5 and the Mi 5s is an odd successor - it's not necessarily better than the Mi 5, it's just different. As such, it will surely appeal to new users, but it isn't likely to draw those who are looking to upgrade from the Mi 5. And we guess the company is alright with that and we can't blame them. If you are among the brand's fans, just make sure you approach the Xiaomi Mi5s with the right set of expectations. The Mi 5 went on sale in April and the market has changed quite a bit since then. While Xiaomi is having a very successful year so far, especially with the mid-range Redmi series, the competition in the higher-end is unprecedented. In the wake of the Galaxy Note7 demise, the iPhone 7 release, and the V20 stepping up LG's game, Xiaomi is shifting the spotlight back to the Mi flagships with its new Mi 5s and Mi 5s Plus updates. The Xiaomi Mi 5s takes after where the Mi 5 left off and makes a few notable steps to improve its flagship status - it switches to the latest Snapdragon 821 chip, ups the base storage, and the most obvious change - it retires the glass panels in favor of a metal unibody. The main camera is one of the highlights of the series, and while the Mi 5s wasn't treated with the dual-camera upgrade, it's sensor is as premium as it can get. Instead of the small 16MP 1/2.8" sensor, the Mi 5s offers a bigger 12MP 1/2.3" one. The sensor's pixels grew 40% bigger thanks to the bigger estate and smaller resolution, which will help the Mi 5s resolve more detail and capture more light in the long run. Finally, there is more battery juice available to the new MIUI 8 and, in combination with the power-efficient Snapdragon 821 chip, our expectations are quite high. So far, so good. The Mi5s, however, is not all about upgrading. While the design and some of the hardware bits are now better compared to the Mi 5, some of the good stuff was axed, too, such as the camera's Optical Image Stabilizatoon (OIS), the Gorilla Glass 4 on the screen, as well as the IR port. The force press support on the other hand is exclusive to the 128GB model only so few people would get to enjoy the feature. The rest of the omissions are hardly a surprise to any Mi fan. Xiaomi only puts microSD slots on its more affordable phones and they hardly have a phone with a user-removable batery so we didn't expect otherwise in both these respects. Xiaomi Mi 5s comes in a rather small box, which contains only the basics - a USB Type-C cable and a wall plug. Luckily, the provided charger supports QuickCharge 3.0, so you won't need to buy a new one. Xiaomi Mi 5s spreads at 145.6 x 70.3 x 8.3 mm, which is just a millimeter taller, wider, and thicker in comparison with the original Mi 5. The Mi 5s has gained some weight, though, due to the design shift towards metal. The phone now weighs 145g, 16g heavier than the Mi 5. Then again, we remembered the glass and ceramic editions of the original Mi 5 and that's when we stopped staring at this beauty and realized Xiaomi switched from glass to metal. And that's a great thing. The metal body and its pleasant matte finish improved the grip by a mile, while the extra weight is welcome as it makes the Xiaomi Mi 5s feel a lot more solid. The Mi 5s, thanks to its 5.15" screen, is still a very compact phone and a pleasure to handle. It fits easily in any pocket or purse and the newly improved grip will make shooting pictures and images easier (and surely, less prone to accidents!). Xiaomi Mi 5s has a pretty standard set of controls. Above the screen is the earpiece flanked by a couple of sensors and the 4MP selfie camera. Below the display is the familiar trio of capacitive touch controls. The Home key is not clickable and has an embedded always-on fingerprint scanner within its surface. The Task Switcher and Back keys are marked by two tiny dots with white backlighting. Xiaomi uses the Qualcomm's ultra-sonic technology, also known as Snapdragon Sense ID, on its fingerprint sensor. The utlra-sonic sensor detects the ridges, pores, and other details on your finger by transmitting sound towards the finger, which bounces back on the receiving surface. In theory, this method should be more accurate and faster than the wide-spread capacitive sensors, which scan a 2D image. It is indeed very fast and responsive, but it is just as fast as the one used on the Huawei P9. And its accuracy isn't something to talk about either, because there are times when the sensor underperforms. The left side of the Mi 5s has the dual-SIM tray, while the right one houses the volume rocker and the power/lock key. The analog audio jack is lonely at the top, while the bottom of the Mi 5s packs the USB Type-C port surrounded by two symmetrical grilles - one for the primary mic and one for the loudspeaker. Finally, the new 12MP snapper is on the back accompanied by a two-tone LED flash. The second mic is also around, embedded within the antenna band. The Xiaomi Mi 5s features a 5.15" IPS display of 1080p resolution, similar to the one utilized by the original Mi 5. A density of 428ppi is more than respectable and leaves the Snapdragon 821 chip with power to spare on tasks and productivity, so we don't mind the lack of Quad HD resolution. Unfortunately, Xiaomi didn't mention any specific glass protection for the screen and we can confirm the Gorilla Glass 4 is gone for good. The Mi 5s acquired lots of big scratches on top of its display just in the week we had it for a review. We suggest that you apply a screen protector on it as soon as you take the phone out of its box. Other than that, the screen offers great viewing angles and there is hardly any color shift or contrast loss when looking the Mi 5s display at an angle. Xiaomi claims the screen will provide up to 600 nits of max brightness. Our test results confirmed and even exceeded the claim for maximum brightness as we measured 650nits worth of luminance. The minimum display brightness is 1.1nits, which is perfectly suitable for late-night reading in a dark room and it's even lower than the Galaxy S7's. The screen's contrast ratio is excellent as well at 1294:1, though slightly less than the promised contrast ratio of 1500:1. Note that we did our color test in Standard (constant) screen mode. If you opt for the Auto one, you will get punchier colors at the expense of color calibration.When it comes to color rendering, the Mi 5s has an excellent color rendering with an average DeltaE of 3.5 and a maximum deviation of 4.5 in the gray color. If all colors stay below 4, the screen is considered to be of perfect calibration level accuracy and the Mi 5s almost achieves that. Finally, the bright screen of the Xiaomi Mi 5s performed excellently in our sunlight legibility test, too. Posting a very high value for a non-AMOLED panel, the Mi 5s ranks the same as its predecessor. The Xiaomi Mi 5s is powered by a 3,200mAh battery, which seems more than enough for a 5.15" device. It's also 200mAh beefier than the one inside the original Mi 5. We ran our battery test, and the Xiaomi Mi 5s scored an 84h rating, which means you can count on the battery to last three and a half days if you do an hour each of calling, web browsing and video playback a day. While the browser and video playback times are similar to the ones we got from the Mi 5, the call test and the standby performance turned out a bit lesser and thus the reason for the lower final rating. If you want to use the phone with two SIM cards, you'll end up with an 80h rating. While the rating is quite good for a flagship, we are a bit disappointed. The Mi 5s should have brought us better battery life thanks to its bigger battery, energy-efficient chipset, and optimized MIUI 8, but apparently - this didn't happen. The Xiaomi Mi 5s supports 9 LTE bands, and you can tap to an LTE network on either SIM, but once you do, the second one will be limited to GSM connectivity only. As for that, the Mi 5s also offers quad-band GSM connectivity. There is quad-band 3G connectivity with HSPA support. The rest of the connectivity features include single-band Wi-Fi a/b/g/n/ac support and Wi-Fi Direct. There is also support for Bluetooth 4.2, NFC, GPS with GLONASS and Beidou. There is no FM radio support. Xiaomi Mi 5s comes with USB Type-C port. Media transfer mode is supported for accessing the phone's built-in memory over a USB connection. The port also supports USB On-the-go for connecting USB peripherals such as pen drives, keyboards or USB hard drives, but you'll need to buy a proper adapter for that. There is no IR blaster on the Mi 5s. The MiRemote app is on board, but it can only control smart devices connected to the same wireless network. The Xiaomi Mi 5s comes with Android Marshmallow and MIUI 8.0. MIUI is one of the most comprehensive customizations of Android to date. It has a big following in China where Google services are not accessible so Xiaomi refocused the ecosystem away from Mountain View's services. For those living elsewhere, the official and not-so-official importers are providing various international (global) ROMs, which come stripped from the Chinese services, in favor of Google's. MIUI 8 starts off with a fresh overhaul on the visuals but the new icons, color scheme, and animations are more of a refinement rather than a departure. But the looks are just a minor part of the way MIUI is different from stock Android. The highlights of the new features are Dual Apps and dual spaces. Dual Apps means you can have two instances of the same app on your device, so you can, for example, have two WhatsApp accounts on the same phone, one for each SIM, something you couldn't do before. Any app can become a dual-app - you just need to enable it from settings.The second instance has a yellow indication on its app icon, so you'll always know which instance you are opening. Dual spaces lets you have two different workspaces on your device, each with its own set of apps, customizations, and image gallery, and you can enter a custom passcode or a different fingerprint to enter either of the space. Configuring a second space is very easy and straightforward. After setting a different PIN and/or fingerprint, you can import and share photos, files, and apps between the two spaces, or choose to keep those entirely separated. You can also opt to view notifications from the other space, so you won't miss anything. Switching between those spaces is hassle-free (you even get a Switch shortcut in the notification drawer), and it's lightning-fast thanks to the Snapdragon 821 chip and the 3 (or 4) gigs of RAM. There are more novelties in MIUI 8. The Phone app and Caller ID are smarter than before now. There is also a brand new Gallery app, a new Notes app, new advanced image and video editors, and a new Quick Ball function that puts a hovering circle on the side of the display that houses quick shortcuts to various functions. Touching Quick Ball pops up to 5 shortcuts and you can put here pretty much anything - from Android actions to app shortcuts. The Ball can also hide automatically on chosen apps, and move aside when you are running a fullscreen app. The lockscreen is fairly standard (time, notifications, a couple of shortcuts), but once you set up the fingerprint reader, you'll rarely see it anyway. Still, the Wallpaper Carousel can put beautiful images on the lockscreen every 15 minutes. The always-on fingerprint sensor proved quite accurate and can take the phone from sleep to homescreen pretty quickly (the lockscreen is bypassed). It's as fast as some of the latest flagship implementations, which is quite a treat. MIUI has a simple philosophy - every shortcut, plus widgets of your choosing, are dropped on the homescreen. You get a docked menu for the most commonly used apps, of course. The homescreen also supports wallpaper carousel, you can enjoy different beautiful wallpapers all the time. The notification drawer sees the biggest visual change, with a consolidated list of quick toggles, notifications, and a weather panel at the top that changes color and animation according to the weather. The app switcher feels like it came out of iOS - apps are either represented by their icons, in a single horizontal row, or by appropriate thumbnails in the same manner. Themes are fully supported and several are available out of the box. You can download more - they change wallpapers, lockscreen style, system icons and font, sounds too. Finally, MIUI 8 supports scrolling screenshots - the feature lets you take a screenshot of an entire page by scrolling and combining multiple images into one long screenshot that you can then crop to your liking. The Xiaomi Mi 5s runs on the latest Snapdragon 821 chipset with 3GB of RAM. There is a more powerful Mi 5s model with 4GB RAM and double the storage, too. The Snapdragon 821 SoC improves on its predecessor with better power efficiency and higher performance. You can't have both at the same time though - the manufacturers can either opt for the slightly higher processor and GPU frequency for about 10% performance bump (as is the case with the Mi 5s Plus phablet), or keep the original clocks in order to gain better battery life. Xiaomi chose the latter for the Mi 5s and thus it offers the same quad-core Kryo processor with two cores ticking at 2.15GHz and two running at 1.6GHz as its 64GB Mi 5 sibling. The Adreno 530 GPU is also clocked at the same 624MHz frequency as the one inside the Snapdragon 820. There is no doubt the Snapdragon 820, and now 821, are among the most popular choices for the flagship crop, so even without running benchmarks, you can rest assured the Mi 5s is a beast. But we're not the kind of reviewers that work with assumptions, so we sure did run our fair share of benchmarks. Join us as we dig into those scores and framerates. A single Kryo core shows a rather uninspiring result within the GeekBench 4 benchmark, but it's on par with the competition, except for the A10 processor in the iPhone 7. It also doubles the performance of the Cortex-A53 inside the Huawei nova. The four Kryo cores combined do great, as usual, but they can't compete with the combined power of the eight cores inside the Honor 8 (4xA53 + 4xA72), or the dual-core A10 Fusion CPU inside the iPhone 7. The 10% bump on the Xiaomi Mi 5s Plus is once again clearly visible in the multi-core results, which means Qualcomm fully delivered on its 10% performance jump. Moving on to Basemark OS II 2.0 to look at some numbers representing overall performance. Here the Mi 5s is in a group with its Mi 5 brother and the OnePlus 3, running on the same chips. It did a notch better compared to all other devices we've tested but the iPhone 7, which might be due to a faster storage or more efficient MIUI 8. Antutu is also showing the Mi 5s in a good light - it outs the same scores as all S820 devices we've tested so far, though the OnePlus 3 has some supremacy here. The BaseMark ES 3.1 test is also available on the iPhones, where the iPhone 7 is ruling the chart by miles. The Mi 5s does about the same as the other Adreno 530-powered smartphones, but behind the Galaxy S7's Mali-T880MP12 GPU. The GFX tests reveal that the Mi 5s raw performance is on par with the other Snapdragon 820/821 devices, and can be bested only by Apple's A10 GPU. The Mi 5s has an advantage over some of its competitors such as the Galaxy S7 and the LG G5, because of its lower screen resolution. The Adreno 530 is a monster when displaying 1080p resolution, though still not monster enough to beat the iPhone 7 Plus (also 1080p). Xiaomi Mi 5s delivers flagship-grade performance, there is no denying that. The phone runs cool at all times. The thing is Xiaomi may have overstressed the importance of having the Snapdragon 821 chip, as the chipset used for the Mi 5s has literally the same performance as its 820 predecessor. The Xiaomi Mi 5s, just like the Google's Pixel flagships, comes with the new 12MP Sony IMX378 sensor. It is not very high resolution - 12.2MP - but it has 1.55µm pixels. Physically, it is a large sensor, too, 1/2.3", matching the Xperia Z series, which pumps out a lot more megapixels than the Mi 5s. The new IMX378 sensor is an upgrade over the IMX377 used on the Nexus 5X, 6P and HTC 10. It now supports phase-detection autofocus, faster and better HDR processing, higher frame rate support for videos. The highlight of the new optimizations is the handling a big chunk of the image processing on-chip thus reducing the workload on the image signal processor (ISP). The latter helps for shooting and processing HDR photos much faster. The 12MP sensor has a relatively wide aperture of f/2.0 and a two-tone dual-LED flash. The optical image stabilization from the Mi 5 is gone, though. The MIUI 8 camera interface is fairly simple and features toggles for the HDR mode, the flash and the video camera. The available advanced modes are Panorama, Beautify, Scenes, Timer, and Manual (with shutter speed up to 32s) as well as the camera settings. Seventeen live filters are at your disposal, too. When it comes to daylight shots, the Xiaomi Mi 5s gets a straight A right away. Its camera may not have as many pixels as its Mi 5 predecessor, but the per-pixel quality is very high. Noise is kept low and photos come out rich in detail without being over-sharpened. Even foliage is rendered great. The captured colors are very accurate, the white balance is right almost every time, and the dynamic range is way above average and definitely flagship-worthy. Finally, the bokeh effect in the close-up shots is quite nice, too. You'll probably want to leave the HDR mode on Auto, because the new sensor doesn't slow when shooting HDR. The HDR mode has got a massive improvement over the Sony IMX377 sensor, as promised. There is a huge improvement in the restoration of both the highlights and the shadows. Even the digital noise gets lower. Unfortunately, the low-light photos came rather unimpressive. The Mi 5s had really hard time getting the focus right and when it did, the images came out with poor detail and washed out. Luckily, you can use the manual mode and tweak the ISO and exposure time settings to achieve better low light sots, but you'll need a small tripod or at least a stable surface for shooting this way. The results are worth the hassle, though. The dusk shots, on the other hand, turned out OK with average detail and high dynamic range. You can capture both landscape and portrait panoramic photos with a 180-degree field of view. Shooting is easy and the resolution is very high (up to 60MP, 3,800MP tall). The image quality is above average - there is enough detail, no bad stitching and accurate colors. The dynamic range and the resolved detail could have been better, though. Xiaomi Mi 5s features the same 4MP UltraPixel front-facing camera for high-res selfies we met on the Mi 5. The images came out with more than enough detail, high contrast, and pleasant colors. The dynamic range is above average, too. We really like this sensor for selfies. The Xiaomi Mi 5s is more than capable of pulling its own weight in our Photo Comparison tool. You can see it puts up an excellent fight against the other snappers we've tested and comes on top even against some far pricier options. Video mode gives you a choice of 2160p @ 30fps and 1080p @ 30fps for common shooting with a 720p @ 120fps option if you want some slow-motion effects. There's no 1080p @ 60fps mode though, which would make a big difference for fast-paced scenes. Also, changing resolution involves going to Modes and then in the advanced settings, which isn't all that convenient. Anyway, the 2160p videos are captured at 42Mbps bitrate and have rock solid 30fps. The audio is stereo captured at 96KBps bitrate. The video quality is very high, among the best we've seen, with sharp (but not over-sharpened), detailed image. The colors are spot-on, while the dynamic range is above average. The audio quality is OK, there are no traces of compression, but you'll notice it goes towards poor on more demanding scenes (concerts, loud crowds, cars honking, etc.). 1080p videos are shot at 20Mbps bitrate and the same audio. The video quality turned out great for 1080p, also among the best we've seen so far, with great amount of resolved detail, accurate colors, and above average dynamic range. Unlike the 4K samples, the 1080p ones came out a bit over-sharpened, which may not be everybody's cup of tea. You can also download the 4K@30fps (10s, 50MB) and the 1080p video (10s, 25MB) samples taken straight off the Xiaomi Mi 5s. The new IMX378 sensor is capable of EIS and it's your only option for the videos since there is no optical stabilization. It works on both 1080p and 2160p videos and doesn't reduce the field of view. The results are a mixed-bag though. The stabilization indeed does a good job most of the time, but there is noticeable stuttering when panning or moving, which eventually ruins the positive first impressions. It's worth noting the poor stabilization results are not the sensor's fault. We've already tested the Pixel XL, which comes with the same IMX378 sensor and relies on EIS only, and the results were spectacular. Finally, you can use our Video Compare Tool to see how the Mi 5s stacks against the competition when it comes to video capturing in both 2160p and 1080p modes. Xiaomi Mi 5s is a great flagship with excellent build quality, performance, battery life, and imaging skills. It makes a few notable upgrades over the Mi 5 predecessor - a metal unibody, a bigger battery, a more power-efficient chipset, and a capable main camera. But it also loses a few things over the Mi 5 that many would consider crucial - camera OIS and Gorilla Glass protection. The IR port is gone for good, too. So, is the metal body and the new camera sensor worth sacrificing the screen protection and the benefits of OIS for low-light photography? There is no easy answer to this. The Mi 5s is indeed superb at design, handling, power, and daylight shots. Its new software image stabilization helps the videos, too, but it's not as good as an OIS solution. But then again, people shoot a lot more in daylight rather than low light and the Mi 5s camera is a huge improvement over the Mi 5 regarding image quality. Long story short - Xiaomi Mi 5s is a true flagship with top-notch capabilities. And if it weren't for the easily scratchable screen, we'd consider it perfect. It's a worthy purchase due to its great pricing, though the Mi 5 owners should probably skip it and wait for the Mi 6 next year as they won't gain much from the 5s iteration. Build quality is excellent, and we like the metal unibody more than the glass one. The Mi 5s has stunning looks achieved by shape, choice of materials, slim profile, and lightweight body. The display is great: it offers 650+ nits of brightness, high contrast, and great legibility in direct sunlight. The minimum brightness is superb for night reading, the blacks are deep enough, and the viewing angles are decent. We wish it had a better protection against scratches. Battery life is very good with an endurance rating of 85h, but a step down from the Mi 5 where it should have been an improvement. Rich wireless connectivity options, but no FM radio or IR blaster. MIUI 8 is a clean and light shell on top of Android Marshmallow and offers rich customization options. The new Dual Spaces and Dual apps options are great additions. The Snapdragon 821 chipset offers stellar performance though there is no improvement from the Mi 5 and its S820 chip. If there is anything to note, it runs cool, and there is no apparent overheating or throttling. Audio output starts off great, degrades with headphones. The speaker loudness is very good, but the sound quality is barely average. Camera photos are great, with plenty resolved detail, high dynamic range, and excellent colors and contrast. The new camera produces better shots than the Mi 5 16MP snapper, but lacks optical image stabilization and sometimes that hurts the quality. The picture on the 4K and Full HD videos is excellent with plenty of detail and high contrast, but the 1080p samples came a bit oversharpened. EIS may cause some stuttering in videos and the stereo audio capturing is of poor quality. There are lots of options to consider if you are looking for a smartphone like the Mi 5s, but you haven't settled on a particular brand. The compact flagship class, where the Mi 5s falls under, has been flourishing this year. The LG G5 price, for example, has fallen to the Mi 5s levels, and the G5 will give you a better and higher-res display, a unique modular design, and an additional main camera for wide-angle shots. LeEco's Le Pro 3 is a good match for the Mi 5s with the same screen resolution, chipset, and a capable camera setup. It's cheaper and offers a bigger screen estate and battery over the Mi 5s, but its availability is quite limited. You may want to consider the ZUK Z2 Pro, whose price has fallen quite a bit since its release in June. It will give you an AMOLED screen and 6GB of RAM, powered by a Snapdragon 820 chipset and a 3,000mAh battery. The ZUK isn't among the most popular brands out there, but its unique glass design and launcher may fit you well. Samsung Galaxy S6 and S6 edge cost the same as the 64GB and 128GB Mi 5s respectively. Both offer higher-res AMOLED screens, very capable chipsets, and great 16MP main camera with OIS. The S6 edge has a superior design and you may want to give those two a try. There are two very intriguing 5.2" devices cheaper than the Mi 5s, yet equally intriguing - LG Nexus 5X and Samsung Galaxy A5 (2016). Both are powered by lesser chips, but offer great designs and user experiences. The Nexus, as usual, focuses on pure Android OS and fast updates, while the Galaxy A5 has a punchy Super AMOLED screen and OIS main camera. Finally, there is always the old Mi 5, which has a glass back, a higher-res camera with OIS, and a better battery endurance. And you get these for less cash. Instead on a high note, we'll end this review expressing our mixed feelings. The Xiaomi Mi 5s is easily likable and ticks all the right checkboxes for a flagship phone. The thing is that we already had that with the Mi 5 and the Mi 5s is an odd successor - it's not necessarily better than the Mi 5, it's just different. As such, it will surely appeal to new users, but it isn't likely to draw those who are looking to upgrade from the Mi 5. And we guess the company is alright with that and we can't blame them. If you are among the brand's fans, just make sure you approach the Xiaomi Mi5s with the right set of expectations.